LIZ EARLE INSTANT BOOST SKIN TONIC 200ml. Instant Boost Skin Tonic with its heavenly scent, revitalises, soothes and tones for radiant-looking skin. Suitable for all skin types. 2x LIZ EARLE INSTANT BOOST SKIN TONIC 200ML (400ml total) brand new. Condition is New. Dispatched with eBay delivery – Shutl 2-3 days. 200ml Full Sized Item. Instant Boost Skin Tonic. Contains aloe vera, calendula, chamomile, cucumber and vitamin E, plus rose-scented geranium pure essential oils. Twist up cap, pour a generous amount onto cotton wool and sweep over your face and neck. Revitalise your skin with this specially developed tonic from Liz Earle, the health and beauty expert. Using naturally active ingredients, the Skin Tonic will help to instantly boost your skin tone, revitalising and comforting with its aloe vera essential oils and natural vitamin E.
2x Liz Earle Instant Boost Skin Tonic 200ml. Condition is New. Dispatched with Shutl 2-3 days tracked. Liz Earle Instant Boost Skin Tonic 200ml. Condition is New. Dispatched with Royal Mail 2nd Class. This 200ml bottle of Liz Earle Instant Boost tonic is a gentle, soothing, and effective toner for all skin types. Eco-friendly, Instant Boost contains no alcohol, and no animal testing is involved in its production. 2x Liz Earle Instant Boost Skin Tonic 200ml. Condition is New. Dispatched with Royal Mail 2nd Class. LIZ EARLE 'INSTANT BOOST SKIN TONIC SPRITZER'. REVITALISES, SOOTHES & TONES FOR INSTANT RADIANCE. AWARD WINNING. Liz Earle Instant Boost Skin Tonic 200ml Face/Facial Toner/Toning . Condition is New. Dispatched with Royal Mail 2nd Class. 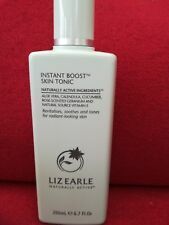 200ml Liz Earle Instant Boost Skin Tonic unopened and unused. LIZ EARLE INSTANT SKIN TONIC SPRITZER 30ML. Bag will automatically be added to your order. Refresh, soothe and brighten the appearance of skin with this heavenly floral-scented, non-drying toner. Gentle and alcohol-free, it provides an instant boost of hydration to leave skin radiantly healthy-looking. LIZ EARLE Cleanse and polish hot cloth cleanser 30ml. Eyebright soothing eye lotion 50ml. Bag will automatically be added to your order. LIZ EARLE Instant Boost Skin Tonic 200ml - Brand New! Refresh, soothe and brighten the appearance of skin with this heavenly floral-scented, non-drying toner. Gentle and alcohol-free, it provides an instant boost of hydration to leave skin radiantly healthy-looking. Naturally active ingredients include aloe vera to hydrate, calendula, chamomile and cucumber to soothe and refresh, plus antioxidant vitamin E. This revitalising toner is fragranced with an uplifting blend of pure essential oils, including rose-scented geranium, lavender and sweet orange. Brand new, unopened. Recently purchased. LIZ EARLE INSTANT SKIN TONIC SPRITZER 30ML x 4. Bag will automatically be added to your order. 1 x 200ml - Liz Earle - Instant Boost Skin Tonic. Liz Earle Instant Boost Skin Tonic ~ Soothes & Tones ~ Facial Toner ~ 200ml . Condition is New. Dispatched with Royal Mail Signed For® 2nd Class. You are purchasing a 200ml Liz Earle Instant Boost Skin Tonic. This heavenly floral scented toner refreshes, soothes and brightens skin. Instant Boost Skin Tonic. This Heavenly Floral-Scented Toner refreshes, soothes and brightens skin. Revitalises, soothes and tones for radiant-looking skin. Naturally active ingredients include Aloe Vera to hydrate, Calendula, Chamomile and Cucumber to soothe and refresh, plus natural source Vitamin E.
"Revitalises, soothes and tones for radiant-looking skin." Naturally active ingredients including: Aloe Vera, Calendula, Cucumber, Rose-Scented Geranium and natural source Vitamin E. I have far too many products in my bathroom, hence the cheap price. Please not that this is for 2 X Liz Earle Instant Boost Skin Tonic 200ml. I have 2 sets of x2 available. Condition is New. Dispatched with Royal Mail 2nd Class. Liz Earle Instant Boost Skin Tonic 200ml . Condition is New. Dispatched with Royal Mail 2nd Class.